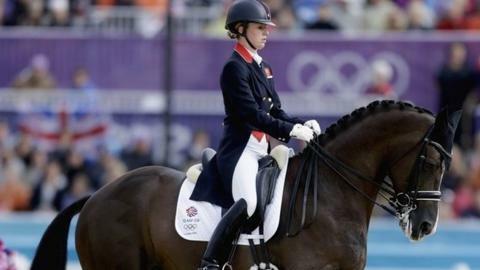 British world dressage champion Charlotte Dujardin won the Grand Prix at the FEI World Cup in Las Vegas. The 29-year-old and her horse Valegro, who won the world title in Lyon last year, recorded a score of 85.414%. It was six per cent ahead of Dutchman Edward Gal in second, while American Steffen Peters was third with 79.057%. Having won the Grand Prix event, Dujardin will seek to defend her world title in the freestyle competition on Saturday. The Grand Prix serves as a qualifier for the freestyle, in which contestants perform a series of movements to music. Dujardin's score could not match the 87.129% with which she and Valegro broke their own world record in Lyon last year, but she said: "I was really happy with the test,. "Valegro has had a 24-hour trip to get here. The last few days, he was actually feeling not quite himself and I was a bit worried yesterday. But he was feeling much better and I had a really great ride." It was clear from the crowd's reaction to her test that Dujardin's fan base extends beyond the UK, with followers from as far as New Zealand and Scotland in attendance to support her. "I've experienced quite a few places over the last few years but the atmosphere here is amazing," she said. Looking ahead to the Freestyle, she added: "I love my music and Valegro enjoys it. I have a lot of fun and I know with this crowd they will be really behind us."